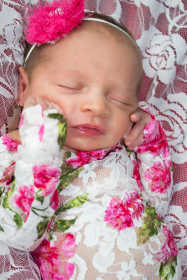 Richard, Tiffany, Noah and Joe West are proud to announce the birth of their daughter and sister, Elizabeth Jean Alice. Elizabeth was born on March 22 at 4:07 p.m. in Nevada. She weighed 5 pounds and measured 17.5 inches. Maternal grandparents are Joe and June O’Connor, Nevada. Paternal grandparents are Jean Conner and the late Alvin Conner, Fort Scott, Kan.